Hello! Here is Réka and today I’m sharing with you some weekly planner pages I created. First of all, it is unbelievable that it will be September in only five days. The summer always ends too fast and I would like if it keeps longer. For that’s why I have decided to make my planner pages of September summer mode using the cute ’Sundance’ Traveler’s Notebook Kit. As you may know from my previous planner post I always make the inspiring monthly page in my planner. For my September’s main page I have used the very cute pink llama illustration and the September word was cut out of the stars green paper from Pretty Little Studios: Wish You Were Here 4×6 Paper Pack with my cameo. I have fussy cut the ’love is being with you anywhere’ sentiment and the leaves from the September’s printables. I really love these colors of these leaves, my favorites totally. I have decided to try a new structure for my monthly spread. On the back side of the previous page I have put my monthly calendar edited by me to know how the days follow each other and I also decorated it with some banner on the top of the page and the cute leaves cannot be missed. On the opposite page I can write the important event or things belonged to that day. I don’t know why but I love using the list structure much more. I have added one squared sheet to the white cardstock and I have written the numbers and days on it with my handwriting and for the Sundays I used the numeric stickers from Pretty Little Studio: Mini ABC – Adventure which come with the kit. I also decorated it with some embellishments and add one tag to the page sideway which marks the monthly page and I can go back easily to it. I hope you have found some inspiration for your monthly planner spread. 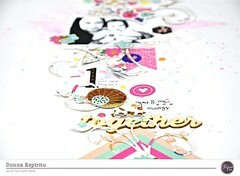 Categories: Clique Agenda | Tags: Clique Agenda, Creative Agenda, Double Page Spread, pretty little studio, Printables | Permalink. This is really nice, Reka! I love how personalized everything is! TFS!